Shopping for the right stone for your benchtop is a big decision and ultimately a lifetime investment! There are a few important things to factor in in terms of practicality, your lifestyle, budget and of course the look that you’re going for in your kitchen. But don’t let that daunt you – there’s an option for everyone. 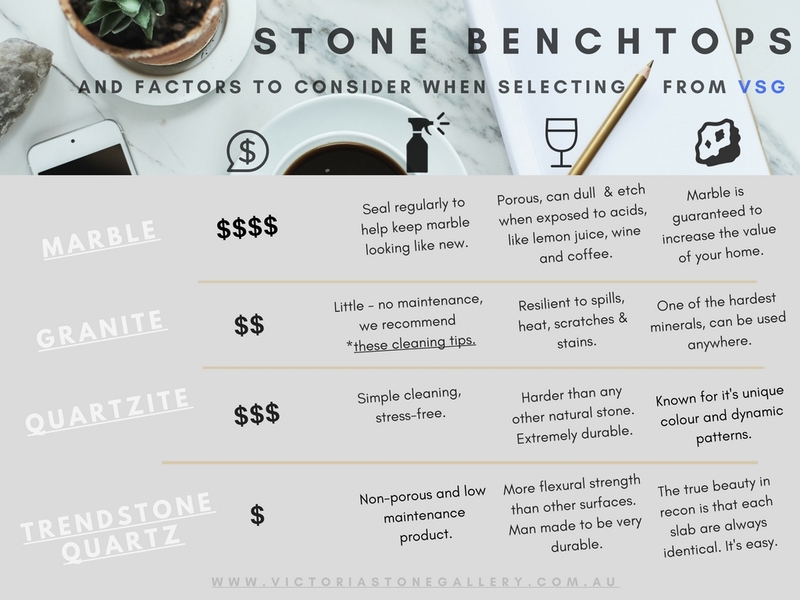 We’ve put together a quick glance at what stone benchtop factors we think might help when considering your choices. Carrara Marble is a timeless classic from Italy. It is in the higher-end range but worth every dollar, and will add value to your home. Marble is a very soft and delicate stone, that requires the correct sort of care. Being more porous than any other stone, regular sealing and maintenance is a must. Granite, on the other hand, is one of the hardest minerals which could be used indoor or outdoor and will out-stand more wine spillages and children’s fingerprints than any other. Our friends at Granite Benchtop NZ compiled a Caring For Your Granite cheat sheet just to show you how easy it is. Sourced from Brazil, Quartzite stone isn’t like anything else we’ve seen before. Its exotic natural patterns and colours formed from impurities mixed in during the formation process make it unique to any other stone. While it imitates the Marble-look, it offers the durability and strength of Granite. Quartzite is a great choice for a statement benchtop piece. Trendstone Quartz is man-made but made from up to 93% natural Quartz and straight to the point – it’s basically indestructible and very affordable. The properties and patterns of each slab are always identical and are great if you want the book-matched look. If you’re after a particularly big surface, Trendstone XL comes in 3.4 x 1.9 m. These slabs broadening your options on what you can do with the stone and ultimately lessen the cost. While the list of stone benchtop factors goes on, we hope this can help point you in the right direction. We are always happy to answer any other inquiries and encourage visits to our Warehouse in Dandenong South. Call us to make an appointment, or take a look at our product catalogue. Alternatives To Marble – An Infographic VSG is Rained Out Today! But What About Our Outdoor Stone?